An Infidel in Paradise by S.J. Laidlaw. Tundra Books, 2013. Currently available. Face Value: I really liked this cover – it has the richness of those gilded covers that are usually only used for books deemed “classics.” The snake poised to strike hints at the danger and high stakes of the story within. For a YA cover, this is not bad at all. Does it break the slate? NOPE. And it’s such a disappointment. Emma is a young woman with unique experiences living all over the globe, which one would hope would make her better able to navigate the intricacies of cultures different from her own. Instead, she wallows in her own self-pity and tromps all over the cultural expectations of her new Pakistani neighbors. And although she could certainly have challenged their male-dominant culture in Slatebreaking ways, she was mostly just obtuse about it. Who would we give it to? It might be a good book for young readers who will be spending long periods of time living in cultural or geographic circumstances vastly different from their home culture. Emma’s behavior and clumsy mistakes would at least model what not to do when living in a different country. Which is kind of the point of the story – watch Emma fumble and learn along with her. Review: Emma’s mother is a Canadian diplomat, which means that Emma has to move around the world and live wherever her mother is called to serve. There are perks to being a diplomat’s kid, including protective security and the opportunity to live all over the world. But being a diplomat’s kid also means that you are constantly starting over as the new girl in school, and always having to adapt to different cultures. Emma is doing the starting-over thing again, this time in Pakistan. And although she has had to move and adapt many times before, this time it’s much harder – because her father didn’t come along. Emma’s parents have split up, and she is still reeling from the pain of feeling abandoned by the only parent who understood her. Although she knows that she should try to move on, she can’t seem to face the changes in her family. Faced with extreme culture shock and self-doubt, Emma sinks into misery and pouts constantly about her dissatisfactory situation. Usually she is willing to make an effort to adapt to cultural norms, but she’s finding it especially difficult in Pakistan. On her first day of school she manages to say something extremely offensive to the Pakistani students, and she also falls head-over-heels for Mustapha. He’s one of the most popular and notable boys in the school. The only problem is that he’s engaged to be married through an arranged match. There was undeniable chemistry between Emma and Mustapha, but I couldn’t bring myself to like their relationship. Emma and Mustapha’s relationship is fundamentally dishonest. That made it very difficult for me to appreciate the moments they had together, no matter how steamy and romantic they seemed. I felt that Emma’s disregard of Mustapha’s commitment to his fiancé was almost disrespectful. This was weird for me as a feminist reader, because I don’t think that arranged marriages necessarily end great for the women. However, Emma was a visitor and a guest in Pakistan. And she chose to engage in interactions with a young man who was already committed and who believed in that commitment. Mustapha is deeply rooted in his cultural beliefs. As he and Emma pursue a romance together, they may be challenging troubling cultural norms about sexual relationships. And that may be Slatebreaking. But Emma’s attitude throughout the whole book is a turn-off. She is so resentful that she had to move without her father that she is purposeful in her disrespect and her destruction of relationships. 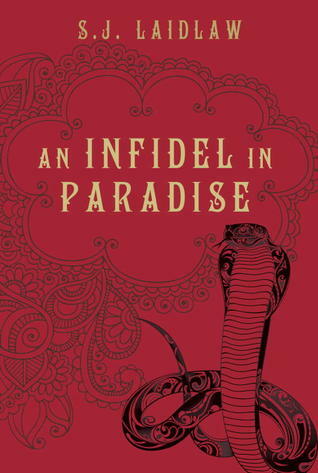 Although I won’t be inviting Emma to my favorite fictional character club anytime soon, I still enjoyed reading Infidel in Paradise. Emma’s difficult transition into this new culture highlighted the vastly different gender expectations within a Muslim culture. It certainly surprised me as I found myself empathizing with characters very unlike those that typically capture my interest. It is an intriguing story, and Laidlaw has definite talent. I will read more of her work, and hope for a protagonist that I can actually like. Reviewed from an ARC received from the publisher via NetGalley. This entry was posted in Reviews, Young Adult and tagged Canada, Cultural Difference, diplomats, Pakistan, travel. Bookmark the permalink.